Though the public may retain a hoary image of the lone scientific or philosophical genius generating insights in isolation, scholars discarded it long ago. In reality, the families of scientists and philosophers in the Enlightenment played a substantial role, not only making space for inquiry within the home but also assisting in observing, translating, calculating, and illustrating. 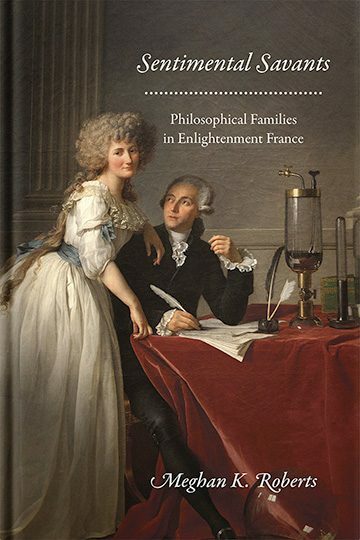 Sentimental Savants is the first book to explore the place of the family among the savants of the French Enlightenment, a group that openly embraced their families and domestic lives, even going so far as to test out their ideas—from education to inoculation—on their own children. Meghan K. Roberts delves into the lives and work of such major figures as Denis Diderot, Émilie Du Châtelet, the Marquis de Condorcet, Antoine Lavoisier, and Jérôme Lalande to paint a striking portrait of how sentiment and reason interacted in the eighteenth century to produce not only new kinds of knowledge but new kinds of families as well.